Anyways, age aside - fashionable as it is to have cupcakes and fondant decorated fashion-cakes, nothing beats an old-fashioned butter cake when it comes to simple flavours. Top, or bottom-up with pineapple slices on a sticky-sweet caramel sauce layer. Butter cream in Monet-worthy colours? Nope. Dainty finger-sized bites? Nope. No frills. Just a good old-fashioned fruity butter cake. 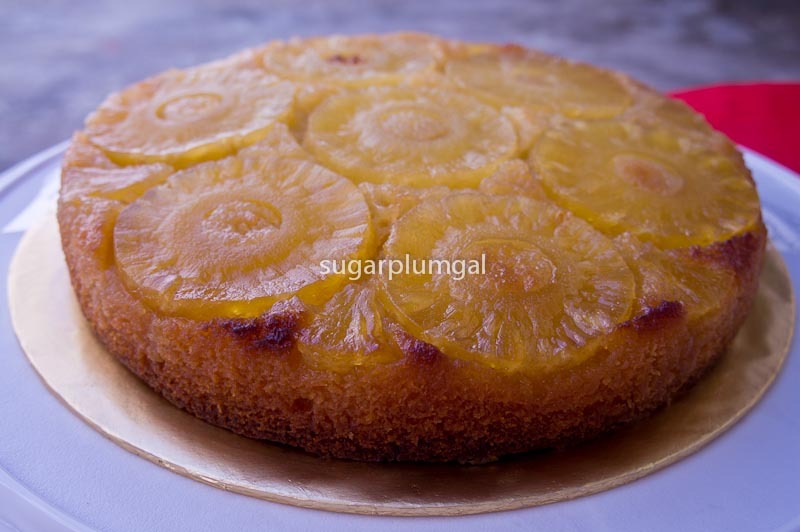 A pineapple upside-down cake. A gloriously golden pineapple upside-down cake with mini golden sunshiny discs. Like rays of sunshine. On a cake. 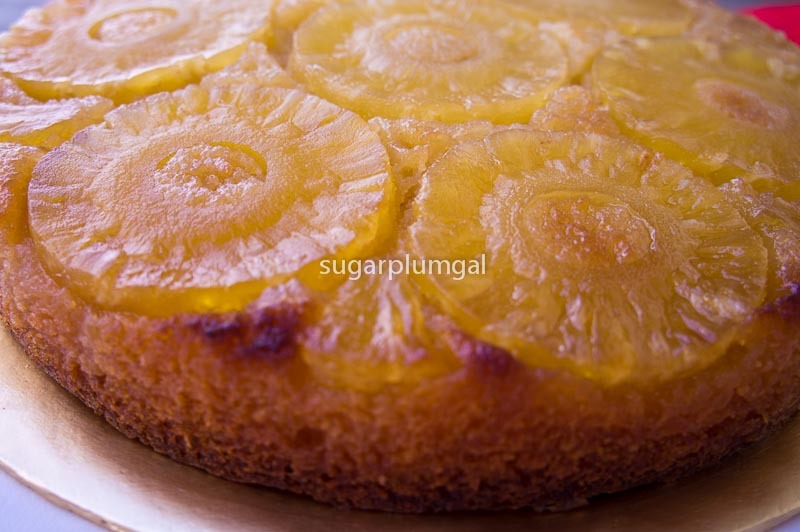 The pineapple upside-down cake is turned over to serve, so that the fruit is served on top. Somewhat like a tart tatin. Start with making a simple caramel which is poured into the cake tin, and pineapple slices arranged over the caramel. The cake batter is poured over this and baked out. To serve, the entire cake is inverted (or turned upside-down) with the pineapple bottom now becoming the top. You get a self-decorated cake, featuring yummy caramelly pineapple slices. The cake is wonderfully moist and buttery too, mostly from the caramel. pineapple rings on the caramel. See the too-light caramel already hardening. The recipe is adapted from Elsa of Simply Recipes. Be warned, this recipe has lots of butter. Lots and lots. It is also rather sweet even though I had reduced the sugar in the recipe. Possibly because of the tinned pineapple slices as well. Maybe I'll use fresh pineapple the next time. I removed the caramel too early, so it's not as browned as I like it to be. Regardless of the colour, it received rave reviews and was polished off as fast as I could cut it. Pineapple Upside-Down Cake - adapted from Simply Recipes. 1. For the caramel topping. Combine brown sugar and butter and melt in a saucepan on medium heat until sugar dissolves and the mixture is bubbly, this should take several minutes. (After sugar dissolves, don't stir.) Pour mixture into a 9 inch round non-stick cake pan. 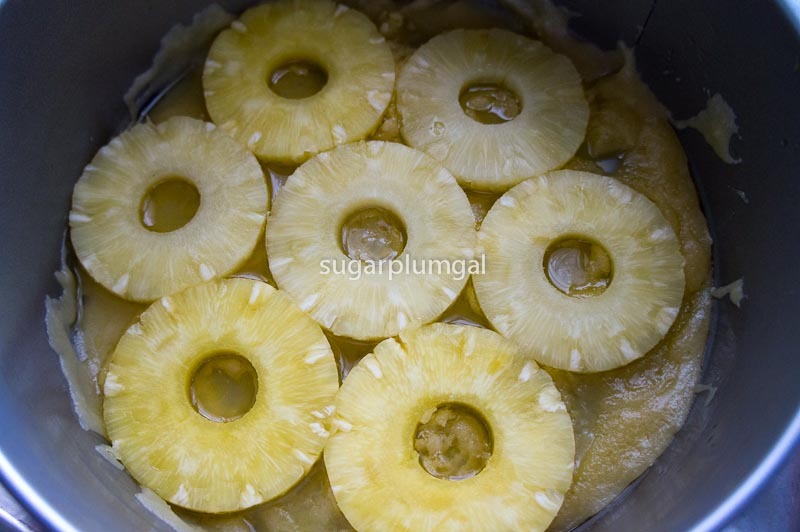 Quickly arrange pineapple slices in a single layer on top of the caramel mixture before the caramel hardens. 2. Preheat oven to 170C. 3. Sift the flours and baking powder together and mix in almonds and salt in a large mixing bowl. 4. In a separate bowl, use an electric mixer to beat the sugar and butter together until light. 5. Add eggs one at a time, beating after each addition. 7. Fold in dry ingredients alternately with sour cream in 2 additions each. Pour cake batter over caramel and pineapple in pan. 8 Bake cake until a skewer inserted into the center comes out clean, about 1 hour to 1 hour 15 minutes. Cool cake in pan on a rack for 10 minutes. Turn cake out onto a platter. Serve warm or at room temperature. The cake baked out to about 1 1/4 inch height in my tin. You can adjust the tin size but bear in mind you want enough surface area for the pineapples. To make removal easier, use a non-stick spring form tin. There is an optional method/recipe for the caramel in the original recipe, but it read too sweet for me.